Introducing the New Nest Thermostat E - What's new? A smart thermostat from Nest at nearly half the price…so what’s the catch? Despite their early reputation as a temporary craze, in recent years it’s become clear that smart thermostats have genuine and tangible value when it comes to saving energy. However, there are still a huge number of households without a smart thermostat with many people regarding them as a luxury they simply can’t justify or afford. Nest by Google is one of the market leaders, Nest, know this and have taken the matter in hand. The Nest Thermostat E is their answer. They have essentially designed a simpler, lower cost version of their latest Nest Learning Thermostat (3rd Generation) to enable more of us to make the move towards a smarter, more energy efficient home. The most obvious difference is the more subtle design of the new model, but at nearly half the price how does the Nest Thermostat E compare in other ways? The key point of difference between Nest Thermostat E and the 3rd Gen model is the price. The price of the new Nest E is £199; compared to the 3rd Gen model at £220, this is a big drop down and is intended to enable more people to access the technology. The Nest Thermostat E has a simpler, more subtle design. This is an intentional move by Nest to offer homeowners a thermostat that blends in with their decor rather than standing out as a feature. The coloured frame has been replaced with white plastic with a ‘ceramic-feel’ finish. The screen appears is covered by a diffuser to further soften the display with a ‘frosted’ effect. The ambient light sensor means that the display will automatically adjust its brightness to suit your home. The Nest Thermostat E comes straight out the box with a pre-set schedule. You can then make tweaks and adjustments in the app. Alternatively, it also has the ‘learning’ ability of the 3rd Gen model which means that after you’ve used it for a week it will pick up your habits with no need for manual programming. As you might expect, the new, cheaper Nest Thermostat E doesn’t include all the functionality of the more costly 3rd Gen. Specifically, it doesn’t have the Farsight feature which will respond to motion and display the time, weather or temperature automatically. While the 3rd Gen model is supposedly compatible with around 95% of heating and cooling systems, the Nest Thermostat E is currently only compatible with around 85% of systems. You can check the compatibility of your system on the Nest website by answering a few questions. Despite the lower price tag, the Nest Thermostat E still features the key benefits that have made Nest market leaders in the smart thermostat market. The app from Nest enables you to monitor and control your heating at your convenience, wherever you are, via an internet connected phone, tablet or laptop. And, if you’re a fan of voice assisted controls like Alexa or Google, it will respond to voice controls too. 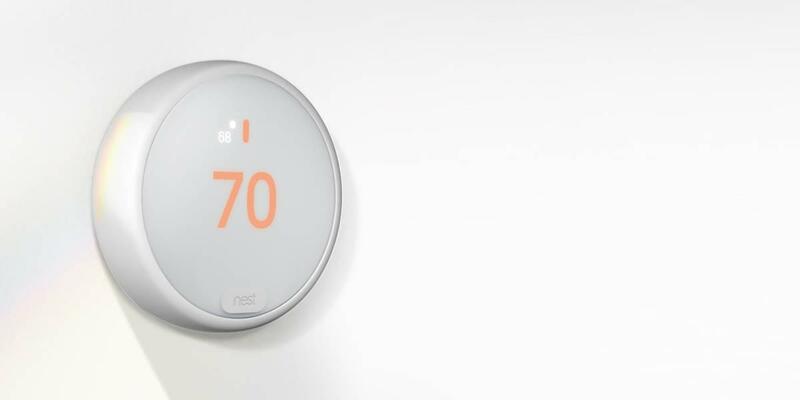 Just like the 3rd Gen, Nest claim that the new thermostat can be installed in 30 minutes or less. They recommend professional installation, especially if you have a dual fuel heating system. In addition to giving you complete oversight and control of your heating, Nest will also let you know if there’s an problem in your heating system that needs addressing before the system breaks down or becomes unsafe. Nest thermostats will not only learn your habits, but will also be able to detect when nobody is home (via your device’s GPS and motion detectors) and turn off the heating automatically. One of the key motivations behind having any smart thermostat is to save energy and subsequently lower energy bills. As with the 3rd Gen model, the Nest Thermostat E has all the energy saving features that make this possible. For example, changing the temperature down to an energy-saving level is rewarded by a leaf symbol. The app will enable you to monitor your energy usage habits so you can identify areas for savings. The Nest Thermostat E will integrate seamlessly with the other products in the Works with Nest program such as Nest Cam, Nest Protect (smoke detector), lights or locks that complete your smart home. Affordability has been a major roadblock for many households who are keen to adopt smart technology in the home. The Nest Thermostat E is not only a more viable option for those people, but also offers unique benefits of its own. The subtle design could easily be argued as an improvement to the standard model’s bold appearance regardless of the price. And for those who are looking for a smart thermostat that lowers your energy use and reduces your bills (without any other bells and whistles like doubling as a weatherman or clock), the Nest Thermostat E could be the ideal choice.